The swimming pool at WellCome Wellness at Fashion Hotel Amsterdam is 14 meters long and has a pleasant temperature of 30 degrees. 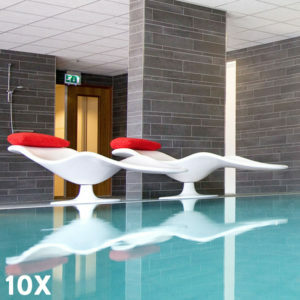 Come relax or swim active laps. In the relaxation area at the swimming pool, you will not miss out on anything: the space is equipped with comfortable loungers and seating areas with various magazines for reading. Want something to eat or drink? You can place your order at the reception. Voor zwemlessen voor kinderen werken wij samen met zwemschool Swim4all. Let op: de helft van het bad is beschikbaar voor de gasten van Fashion Hotel Amsterdam.